When you are getting a divorce, you might want to tell all the details to everyone you know. Conversely, you might also want to keep it to yourself while you process the change. However, some people may need to know the bare minimum for practical reasons, such as friends who might otherwise invite you places as a couple or companies who will need to separate your accounts. Below are sample letters you can send to inform people of your divorce along with suggestions for how to use them. The sample personal divorce announcement is intended to be used for friends and family rather than business colleagues or services. 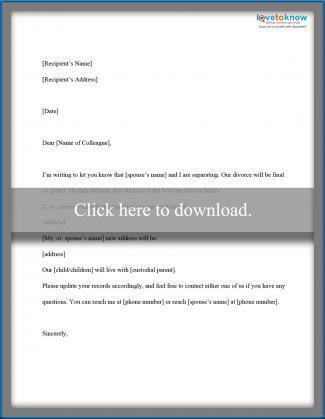 If you need help downloading the sample letter, check out these helpful tips. It's best to keep your divorce announcement simple. You want to give out the necessary details that your friends and family will need to know without being gossipy or tasteless. There is no need to discuss the cause of the divorce, the divorce proceedings, the terms of any settlements, or your feelings about the ex-spouse. To customize this sample letter, insert your spouse's name wherever it is indicated. Also include who will be living at the current home and the new address of the other party. If both parties are moving, include both new addresses. You will also want to include where your children, if you have any, will primarily reside. If you and your spouse previously had a shared email account, be sure to include your new email addresses. 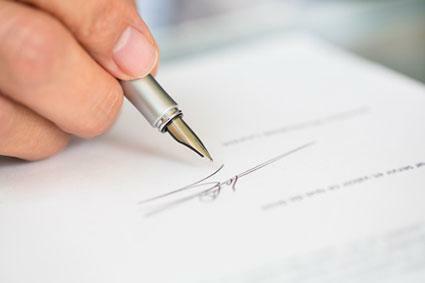 This formal divorce announcement is the one to send to companies with whom you have done business as a couple such as landscapers, daycares and children's sports teams, or to colleagues at your place of work. Especially in a professional setting, there is no need to include any kind of sentiment in your divorce announcement. The purpose of this letter is merely to give people the necessary information to use going forward. Insert your name and address and your spouse's name and address where indicated. If relevant, you may want to indicate your children's address. Additionally, if you and your spouse previously had a shared email account, be sure to inform the recipient of your new email addresses. Finally, if there are specific instructions for the recipient (such as, "The billing statements should now be in my name") you can insert them. The purpose of these sample letters is not to point fingers or to encourage friends to take sides, so do not include more information than necessary. The New York Times warns that, "Beyond the emotional and etiquette minefields that accompany such . . . announcements, there may be legal ramifications." By following the minimal style of the above sample letters, you will avoid appearing inappropriate while still conveying the information that your acquaintances need to know.